One of the most common calls that I get from parents is when there are changes in their baby's poops that they weren't anticipating, especially 1st time parents. And that's because for most of us, if there's a change it's because of something that's off a little bit, not so with babies. 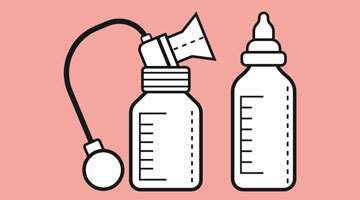 For a breastfed baby, they typically have 8-10 poops a day by the end of the 1st week of life, a lot, with every feed. Usually, sort of a yellowish, soft consistency. But just a few weeks later when they're a month old, the number drops in half. That doesn't mean they're constipated, it means they're maturing. When they hit 2 months old, many babies, breastfed babies, will have 0 stools in a day. They may go 3 days, or 4 days or 7 days completely normally, because breast milk is the perfect food, there's just not the waste to be gotten rid of during that, and people are very concerned that there's constipation if the baby hasn't gone in the last week. But most of the time, that's a normal thing, that's actually a healthy sign of great food being processed well. If a formula-fed baby though goes longer than a day or 2, likely is they are getting constipated. They go from a lot of stools in the 1st week, down to about every day or ever other day by 2 months old. I also should mention that anything that's in this sort of yellow or green or brown range, it's likely to be fine in terms of color. If the color though is black or white or red, those would be times to get in touch with the pediatrician right away.